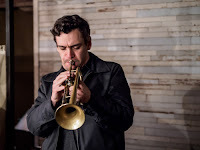 Preparing to review trumpeter Kenny Warren's debut album for Whirlwind Recordings, I discovered he is indeed one busy musician. The Colorado native has issued several recordings called "Laila & Smitty" that is true "Americana" in that the music blends a plethora of influences. Warren is a member of the Balkan/Gypsy Funk band Slavic Soul Party as well as Brian Plunka's Arabic Jazz ensemble Nashaz. Spending time listening to Warren in these different settings, one can hear that the trumpeter has no fear of stretching his boundaries while remaining true to his sound. He's as comfortable appearing in duos with pianist Bobby Avey and saxophonist Tony Malaby as he is with being part of the Angela Morris & Anna Webber Big Band. 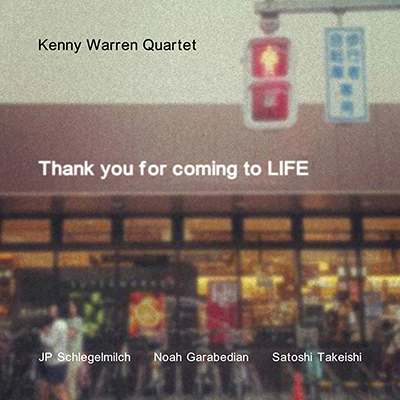 The new recording, "Thank You For Coming to Life", features his working Quartet of JP Schlegelmilch (piano), Noah Garabedian (bass), and Satoshi Takeishi (drums). Actually, listening to the material Warren has supplied his ensemble with, let's call this unit his "playing" band. Longtime friend and schoolmate Schlegelmilch plays here with great power as well as with subtlety, helping to frame the compositions. 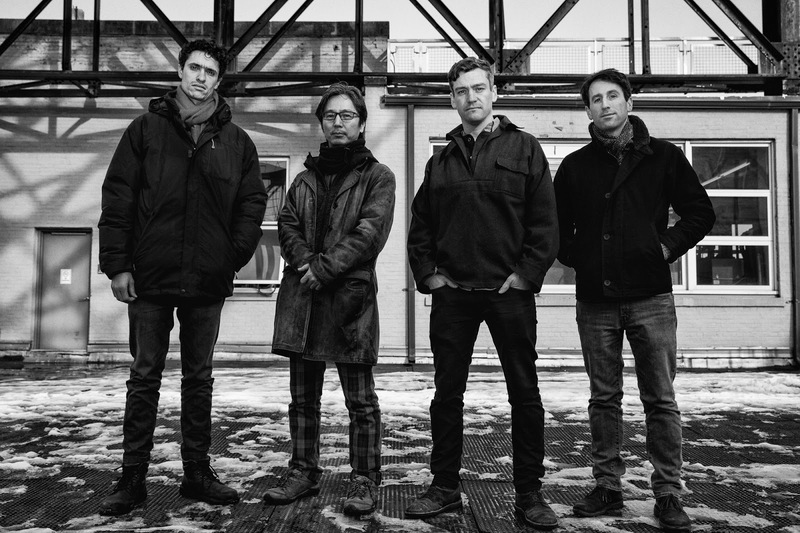 Hearing Takeishi drive the band is such a treat as it gives Garabedian room to move, to follow the pianist or play off what the soloist is doing. The material is multidirectional, the songs episodic, with plenty of room for the players to stretch out, and the joy is they never outstay their welcome. "Stones Change" opens with trumpet only introducing and one can already hear the rhythmic possibilities. All four musicians play the melody before the piece moves out in the piano solo; listen to his deftly Schlegelmilch (formerly with Old Time Musketry) handles the variable rhythms beneath. Then Warren and Garabedian only play the theme before the rest of the band returns and the trumpeter moves into his high-flying solo. 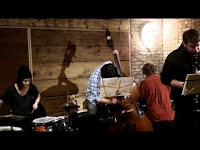 The drummer really kicks the piece forward and, when the foursome returned to the thematic material one hear the Bertolt Brecht influence on the melody line. The magic continues on "Huge Knees", which, at 12:09, is the longest track on the album. Starts out on fire then shifts into an impressionistic "free" section for the piano solos. Note the active and attractive bass work and his the band quietly supports the solo. The intensity picks up under the trumpet solo but closes quietly leading into a fine bass spotlight. Accompanied by the pianist and quiet percussionist, Garabedian gets to the heart of the melody. The final three minutes changes direction and intensity several times, dizzying at times yet delightful always. 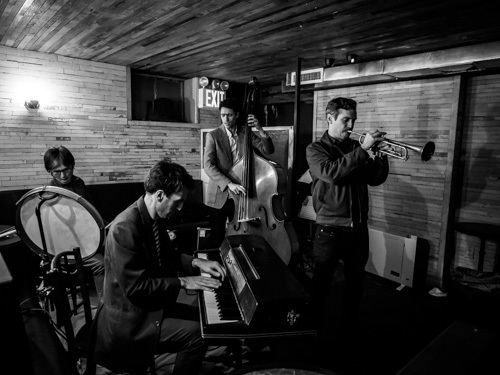 Several weeks ago, I wrote about how pianist Tal Cohen's "Gentle Giants" recording reminded me so much of Wynton Marsalis's "Black Codes From The Underground"; not in its sound as much as its attack and the musicians fresh take on the "tradition." Here as well. It's in Kenny Warren's willingness to really explore the "heart" in each song, to avoid cliche, and to treat this as a recording of a "working band" and not a "star turn." The deeper you get into the album and the music, one hears the playfulness of Clifford Brown as well as the seriousness of Booker Little. Whether it's the New Orleans rhythms of "Cheese Greater" , the somber ballad "Iransaurus Rex", or the handsome, medium-tempo, melodic closer, "Every Moment Is Born Lives and Dies", every thing about this music is real, honest, and enjoyable. The Kenny Warren Quartet "Thank You For Coming to Life" does truly come to "life"; take this music into your life! For more information, go to kennywarren.tumblr.com/bio. 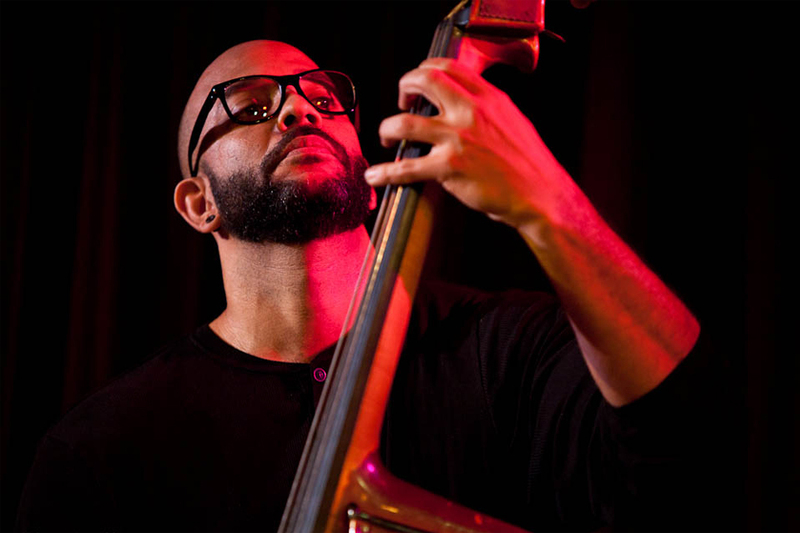 The music that bassist and composer Eric Revis creates is often complex, often challenging, confrontational, and endlessly rewarding. 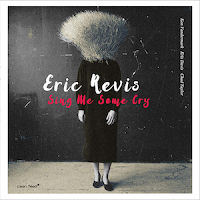 For his new Clean Feed album, "Sing Me Some Cry", he works with a like-minded quartet including Kris Davis (piano). Ken Vandermark (tenor saxophone, clarinet) and Chad Taylor (drums) all of whom he has recorded with before but never in this formation. The bassist has a big yet clean tone, is melodic in his approach to how he he frames each composition, and also creates challenging landscapes for his ensemble. The music is, at times, fairly "free", and never dull. The title track opens the album, an eerie sampled voice and a short bass phrase. Slowly, Revis's longer phrases introduce the percussion, then Vandermark's clarinet and Ms. Davis's active piano fills conjure up images of storms blowing through open windows. Scattered sounds move in and out of the spectrum, not necessarily scaring the listener but letting us know we are in a different world (or, at least, different part of the world. "Good Company" follows, opening with Taylor's powerful as well as musical drum solo. He lays down a modified "Bo Diddley" beat and Ms. Davis riffs atop each until Vandermark (on tenor) introduces the melody. The sax is shadowed by the bass until the rhythm settles into a funky rumble. The long piano solo includes sly references to Thelonious Monk and Eddie Palmieri. The tenor sax, over a rollicking and raucous rhythm section (save for Revis who keeps the music going forward), is delightfully powerful. There's so much to enjoy here, from the terrific drumming of Taylor (listen to how he leads and supports on "PT 44") to how Ms. Davis utilizes the entire piano inside and out (plunking away on "Obliogo" or creating a sonic and funky playground on "Rumples", a piece by guitarist Adam Rogers). For all the hard-edged music, there is also moments of controlled quiet. "Solstice...The Girls (Max & Xixi)", yet another piece that rolls in, though this time gently, on the African rhythms from Taylor's drums, accentuated by Revis plucking way down on the bass. Vandermark's sensuous clarinet through the rhythm with Ms. Davis's piano interjections. There's a haiku quality to the piece. Vandermark's muscular nor carries on quite a conversation with the drums on "Drunkard's Lullaby" (talk about staggered rhythms) - the playful change of tempos do not make this "lullaby" any more restful. The closing track, "Glyph", opens with a statement from the bass and the distant sound of Ms. Davis rolling around the keys and Vandermark adding pithy counterpoint. They rise into the foreground and then fall back (save for the piano), all the while Revis continues to build his solo. The bassist finishes his solo all by himself, there's a short silence, and the group falls into a quiet ballad, led by Ms. Davis's sparkling piano. 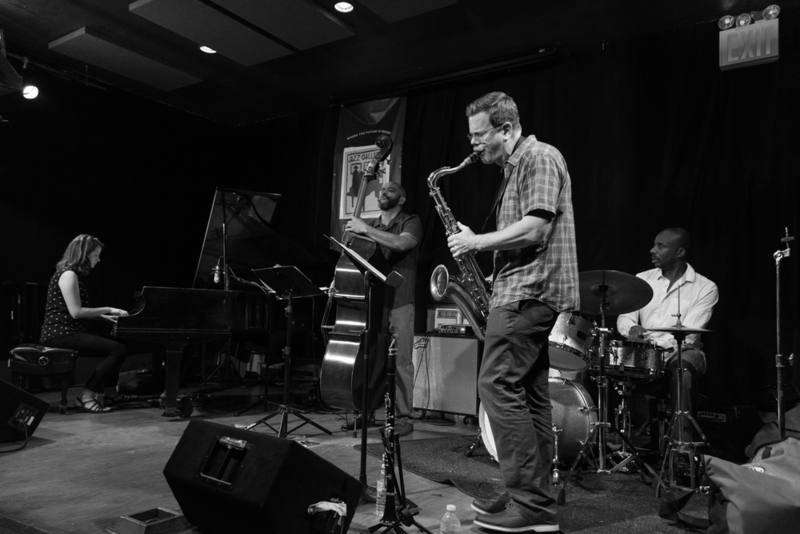 Once Vandermark enters, he plays a plaintive melody on tenor and the piece comes to a gentle close. "Sing Me Some Cry" keeps the listener alert, paying attention because one is never quite sure where this music will. Four master musicians, master improvisors, all doing their best to create a unified statement through the ever-maturing music of Eric Revis. Unified yes, yet exploratory as well, melodic and rhythmically rich, this album is a keeper! For more information, go to cleanfeed-records.com/product/sing-me-some-cry/. Here's "Rumples" - hold on to your speakers! One of the joys of listening to new recordings is having your expectations thrown out with the bath water (so to speak). 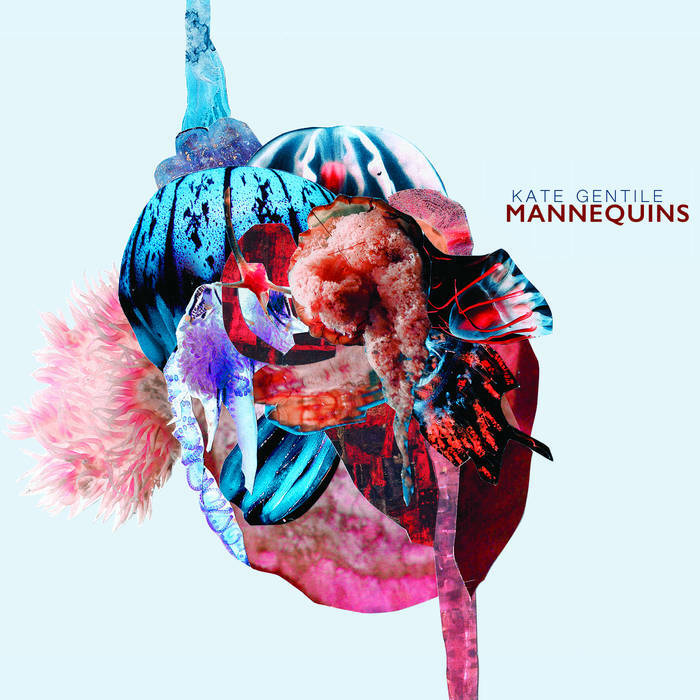 "Mannequins" (Skirl Records) is the work of drummer, vibraphonist, and composer Kate Gentile, a native of Buffalo, NY, who has been part of the busy New York City music scene since her move there in 2011. 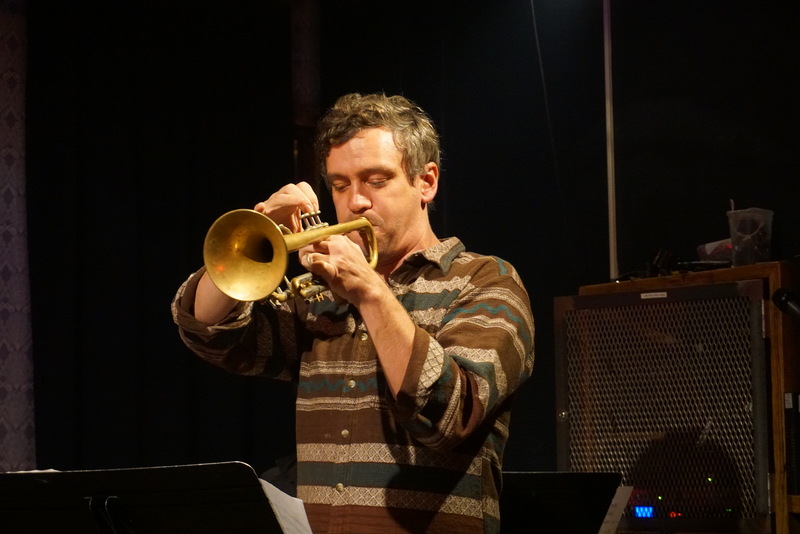 In the past half-decade, Ms. Gentile has worked Anthony Braxton, Marty Ehrlich, John Zorn, and many others. 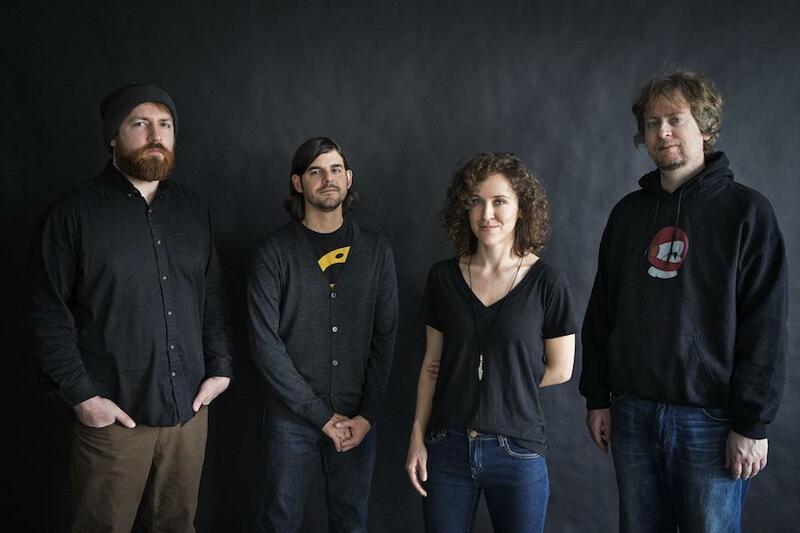 The quartet that gives the album its name includes Jeremy Viner (tenor sax, clarinet), Adam Hopkins (bass), and long-time collaborator Matt Mitchell (piano, Prophet 6, electronics). One can hear the influence of Henry Threadgill and Tim Berne in the linear and episodic nature of the longer pieces yet one also hears the rhythmic influence of the composer/drummer John Hollenbeck. The thematic pattern at the onset of "SSGF" subtly combines Western and Asian Indian influences. Mitchell picks up on that in the opening moments of his solo, then you notice the entire time he's playing is an interaction with the drummer. The playful nature of the six short pieces (all under three minute with two barely 60 seconds long) that are interspersed throughout the program allow us to hear the drummer as a sound manipulator. For example, "hammergaze" features the leaders on various percussion instruments filtered through the Prophet 6 while "sear" is a melodic fragment with bowed bass, a short melodic passage, and percussive sounds. "xenomorphic" is multi-tracked bass with bowed bass in the middle surrounded by by three or four versions of the same fragmented melody. Two of the short pieces, "cardiac logic" and "stars covered in metal" would seem candidates for The Claudia Quintet with the latter track very much n the vein King Crimson. "Full Lucid" opens with a forceful tenor sax solo then percussion joins in. When Mitchell's keyboards enter, they create a trance-like background that soon becomes the foreground - near the end, the rest of the quartet enters with a melody playing it out to the close. The dramatic use of sonic space is a vital element of the album. Pieces such as "unreasonable optimism" constantly change shape and intensity levels, sounding like free improvisation. When you listen again, you hear that there are melodic "triggers" that push the musicians in a new direction. It's a compositional and arrangement tool that minimalists such as Steve Reich in that you do not feel the music shifting but, like the constant flow of a river, this music is ever-shifting. "wrack" lurches forward on the power of Mitchell's left hand in tandem with Hopkins bass line, both pushed by the insistent drumming. Viner digs into his tenor solo, his lines scurrying over the rhythms then notice how the drums and bass move freely below the piano solo without the music losing direction. One imagines that this music is even more powerful in a concert setting. There's nearly 73 minutes of music on "Mannequins" and, considering how closely one should listen, there are times when that seems overwhelming. But when the listener goes back, she/he hears more, the patterns become clearer, the brilliance of the shifting rhythms stand out (excellent sound quality) and you realize how much of a true group effort this is. 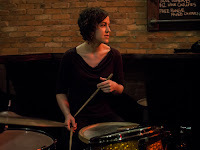 Kate Gentile is no genteel drummer - that's fine. She is an exciting composer and musician to pay attention to now and for years (and projects) to come. For more information, go to kategentile.com.